After over twenty years and seven films, Quentin Tarantino has established a distinctive style that promises audiences a few things to reasonably expect: Crisp, pointed dialogue, a riff on an established genre, a rag-tag ensemble, and a whole lot of violence. His new film “The Hateful Eight,” a murder mystery set in the Old West, contains all of those traits, but also succeeds in upending a few other expectations as well. In their first reviews, the majority of critics have roundly praised Tarantino’s latest, describing it as a playful, patient film that explodes, shocks, and entices. Combining elements of the Peckinpah/Leone western and Agatha Christie’s drawing-room mysteries, “The Hateful Eight” uses its lengthy running time to its advantage, lulling audiences into its world before showcasing how nasty it can be. It’s a claustrophobic hangout film with the majority of the film set in one room as the titular eight slowly turn against each other, first with words and then with weapons. Many have called it Tarantino’s harshest film, one that will either push you out the door or draw you in closer depending on your stomach for cruelty, but at the same time, many have also called it one of his best. Regardless, every Tarantino film is a cinematic event, and “The Hateful Eight” is no exception. Tarantino has created another breathtakingly stylish and clever film, a Jacobean western, intimate yet somehow weirdly colossal, once again releasing his own kind of unwholesome crazy-funny-violent nitrous oxide into the cinema auditorium for us all to inhale. Moreover, Tarantino now makes a serious star of Walton Goggins, giving a hilarious performance as the deeply unreliable Chris Mannix, soi-disant Sheriff Elect of Red Rock, Wyoming. And Ennio Morricone has composed a score which is as sinuous and catchy as anything he has written: a theme with a tense and gloomy tread, coolly cranking up the tension. Stubbornly theatrical, Quentin Tarantino’s three-hour snowed-in Western “The Hateful Eight” is a difficult movie by a director who’s not known for making them. Slow in the early going, it withholds almost all overt action until just before the intermission, at which point it explodes into the meanest, most gruesome and nihilistic violence of Tarantino’s career, only to conclude on a disquieting note of hope. Shot in 70mm, but largely set in one room, this is the writer-director’s take on the betrayed promise of America: a perverse vision of sadistic men comforted by false causes. The American ideal was only ever a lie, says “The Hateful Eight,” but in the end, when the floorboards are slicked with blood and brain matter, and the fatally wounded have enacted a ritualistic parody of justice, it looks toward that same ideal with the hope that one day, someone will be suckered by it hard enough to make it come true. Who could have predicted that Quentin Tarantino, director of “Reservoir Dogs” and “Pulp Fiction,” would eventually turn into a political filmmaker? Here’s to Quentin Tarantino’s cussed perversity. “The Hateful Eight,” his intimate, suspenseful western splatter-horror comedy, has been shot at great expense in the long-gone 70mm format, but the movie itself is set almost entirely in cramped interiors. He’s hired Ennio Morricone to score the thing, but don’t expect rousing new western themes — the music is tense and looping, tinkling with chimes. And the first time a white character has a chance to speak that slur that is to Tarantino movies what “breakin’ my balls” is to Scorsese’s, that white guy — a walrus-mustached bounty hunter embodied by Kurt Russell — politely opts for “black fella” instead. Tarantino seems determined to upend your every expectation. Here’s an engaging drawing-room outlaw mystery that devotes much of its generous running time to what my aunt calls “visiting.” Here’s an octet of gun-toting bastards sitting out a blizzard and striving for decorousness despite detesting one another on grounds of race, region, and politics. In that way, it’s an honest movie about America during the holidays. As the title suggests, some of these characters are not who they seem, and none of them can be trusted. There are no “good guys” in “The Hateful Eight”; all the characters are miserable scoundrels capable of shocking brutality. Joining the action in progress, and slowly teasing out the Eight’s backstories with lengthy exchanges of dialogue turns the movie into one giant poker game with life-or-death stakes, and Tarantino delights in prolonging the tension until the only way it can be released is through a relentless crescendo of violence that’s extreme even by his liberal standards. Tarantino’s movies have often climaxed with Mexican standoffs, like the old spaghetti Westerns of Sergio Leone (whose signature composer, Ennio Morricone, provides “The Hateful Eight’s” dread-drenched score). But “The Hateful Eight” is all Mexican standoff, a sustained, three-hour stalemate conducted at the ends of several large guns. It’s weird to use the phrase “less is more” with “The Hateful Eight,” a movie that is three hours long – but I’m going to go ahead and use it here. It’s so barebones. There’s not a lot of fat. Often, a person can walk out of a movie this long and boast to their friends, “Well, I would cut out this scene and that scene. (I’m sometimes guilty of this, and often these kind of declarations are wrong, but I digress.) Looking back, almost every line of dialogue, no matter how insignificant it seemed at the time, drives the story forward. There’s no dumb subplot about a character we don’t care about. It all takes place right there and, up until the last shot, we still don’t know quite for sure who might betray whom. It’s a deeply unpleasant film — and, one might argue, purposefully so. Rather than following a clean genealogical path back to Hollywood westerns of the Golden Age, “The Hateful Eight” often resembles Italian giallo horror, less for that subgenre’s tendency to luxuriate in synth scores and extravagant lighting setups than for its less-celebrated preoccupation with cruelty and pain. 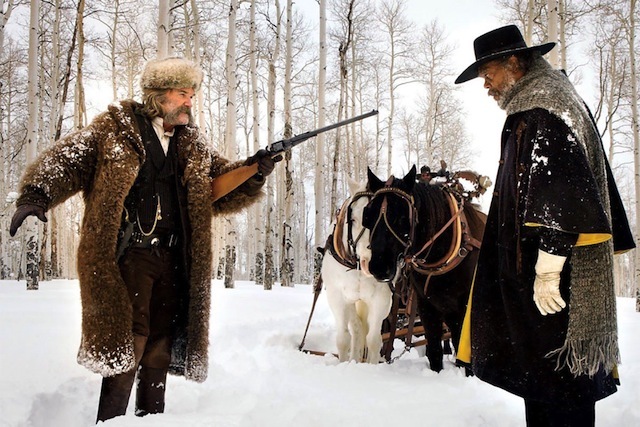 As in those extravagant and supernaturally tinged slashers, characters in “The Hateful Eight” who choose to have any agency apart from maintaining a cover story — for lack of a better term, they’re the “good guys” — find a nebulous reward for forcing fate’s hand. The pursuit of justice that forgets, in the calamity, what it’s pursuing, and why, is another quality that brings Tarantino’s film closer to the narrative schematics of horror, operating under the guise of the western. Horror maestro Thomas Ligotti praised the godfather of the modern era’s investigator, Raymond Chandler, whose iconic private eye Philip Marlowe pursued fearlessly any line of inquiry, wherever it might take him, even if it meant venturing into the heart of the unknown. “The Hateful Eight” reaffirms the marriage of the restless searcher and the waiting abomination — the missing genre link between mystery and horror. Now that he’s given us a talky, indoor Western, one wonders what other strange genre mashups Tarantino has in store — perhaps a black-and-white musical staged as a radio play? In any event, “The Hateful Eight” may frustrate some of his more literally sanguine supporters, but it’s nonetheless an entertaining piece of dialogue-driven theater — with the occasional rifle-shot to the head. Of the eponymous eight, Leigh creates the most memorable new character — the one who stands to gain the most if the others lay each other low. Her bruised face and broken voice suggesting false docility, while her calm indicates something dangerous waiting around the corner. “Domergue’s Got a Secret” reads one chapter heading, though that could just as well be the movie’s title, considering all the crone’s got to hide. Daisy takes a beating over the course of three hours, and though some have already suggested that such brutality (often played for laughs) is no way to treat a lady, Tarantino treats her like one of the guys. Frankly, the movie’s gender dynamics aren’t nearly as rich as its racial politics, though the latter subtext is what makes this more than just a fresh stew of “Grindhouse” leftovers, but a deserving hateful eighth entry in one of American cinema’s most distinctive filmographies. No matter how absorbing its individual scenes, however, “The Hateful Eight” is often hindered by Tarantino’s confidence in the material. For every gripping sequence, there’s an abrupt development or undercooked throwaway line. Crude behavior and blunt twists drown out the subtleties of Tarantino’s filmmaking prowess. The inanity of the violence in the closing scenes overtakes the work’s deeper ramifications and reduces its appeal, turning a complex portrait of attitudes into a simpler one of rage. The grim finality of the movie’s concluding shot ranks as the most cynical moment in Tarantino’s career. But it’s a less savvy punchline than a punch to the gut. (a connection goosed by Ennio Morricone’s sublime red-sauce score), others will be left wondering if that’s all there is. In this case, the answer, sadly, is yes.